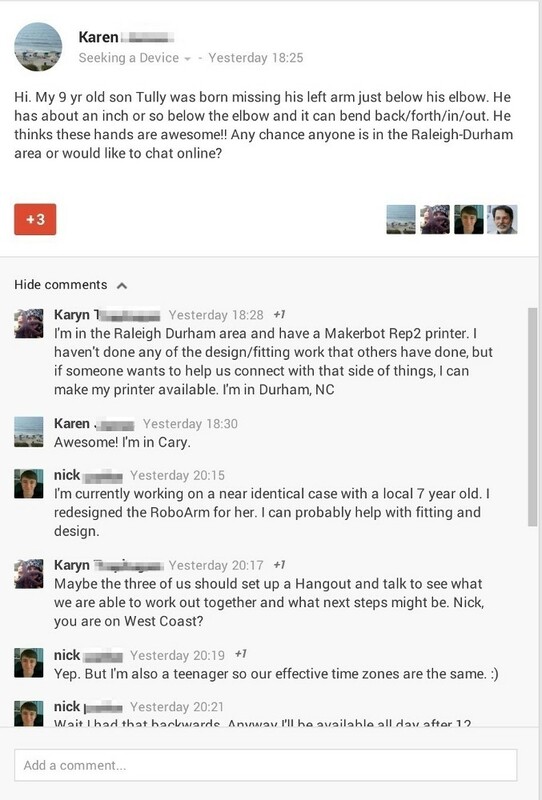 This past summer, after a South African carpenter open-published a design for a 3D printable “robohand”, I created a Google+ community to help 3D printing enthusiasts “develop a distributed pay-it-forward network for design, customization, and fabrication of 3D-printed prosthetics”. Every day brings another inspirational story or innovation. I may start chronicling them here. Anyway, here’s what happened a few days ago. 3 minutes later, a group member offers to help print, but asks for design help. 2 hours later (what took so long?) a teenager —one of our most active and accomplished contributors—steps up to the plate. Within minutes, the new team starts arranging a meeting. They’ll meet over video this weekend.